global ozone observations and measurement techniques. Please contact the corresponding guest editor (srei@ceh.ac.uk) prior to submitting a manuscript to this special issue. Solar UV irradiances were measured at Ushuaia (54° S) and Marambio (64° S) during 2000–2013. The measurements were part of the Antarctic NILU-UV network, which was maintained as a cooperation between Spain, Argentina and Finland. The time series of the network were analysed for the first time in this study. At both stations maximum UV indices and daily doses were measured when spring-time ozone loss episodes occurred. The maximum UV index was 13 and 12 in Ushuaia and Marambio, respectively. The seasonal evolution of O3 and its photochemical production regime in a polluted region of eastern China between 2014 and 2017 was investigated using FTS observations. We observed a broad summer O3 maximum in Hefei, China, and the ozone production is mainly NOx limited in spring and summer and is mainly VOC or mixed VOC–NOx limited in autumn and winter. In this paper, we perform a comprehensive validation of the IASI/Metop ozone data using independent observations (satellite, ground-based and ozonesonde). The quality of the IASI total and tropospheric ozone columns in terms of bias and long-term stability is generally good. 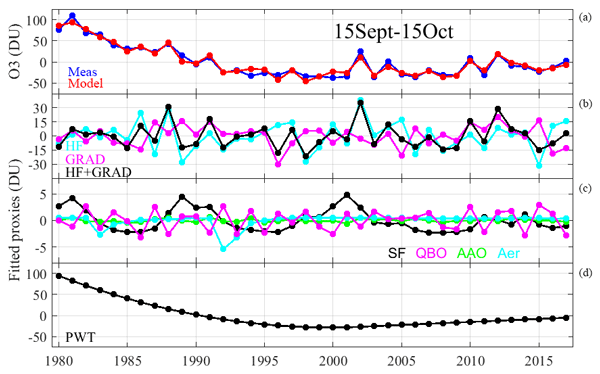 Compared with ozonesonde data, IASI overestimates (underestimates) the ozone abundance in the stratosphere (troposphere). A negative drift in tropospheric ozone is observed, which is not well understood at this point. Total ozone columns (TOCs) measured by Brewer spectrophotometers located at Rome and Aosta (Italy) were calculated using different processing software packages, and the differences in the TOC retrievals are investigated. Large differences in TOC retrievals can be experienced when the instrumental sensitivity exhibits a long-term drift. The variability in TOC retrievals depends on the algorithm for calculating the standard lamp correction. MIPAS was an IR limb emission spectrometer on the Envisat platform. From 2002 to 2012, it performed pole-to-pole measurements of ozone during day and night. ESA recently released the new version 7 of Level 1 MIPAS spectra, which is expected to reduce the long-term drift of the MIPAS Level 2 data. We evaluate the long-term stability of ozone Level 2 data from the KIT IMK processor. Our results indicate that MIPAS data are now even more suited for trend studies, alone or as part of merged data. The Vienna Convention to Protect the Ozone Layer was signed in 1985 to promote research and information exchange on the science of ozone depletion including monitoring of total ozone column and spectrally resolved solar ultraviolet radiation. This is a global challenge and, as such, all efforts to gather data should be consistent. 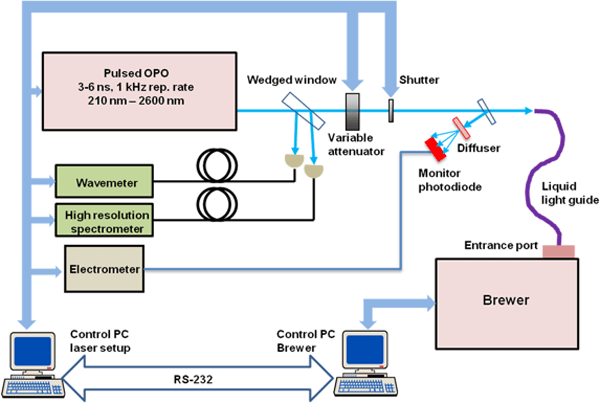 This work has resulted in a framework for all Brewer Ozone spectrophotometers to provide data in a consistent way in terms of calibration and quality assurance. In 2003, the Regional Brewer Calibration Center for Europe (RBCC-E) was established at the Izaña Atmospheric Research Center and since 2011 the RBCC-E transfers its calibration based on Langley using travelling standard(s) that are absolutely and independently calibrated at Izaña. This work is focused on reporting on the consistency of the measurements of the RBCC-E triad (Brewers #157, #183 and #185) made during the period 2005–2016. This paper tackles a major issue for air quality over East Asia: ozone pollution produced over a major source, like the North China Plain, and the contribution of ozone produced while being transported across the continent and the surrounding seas. The main originality of the paper lays in the fact that this photochemical production of ozone is observationally quantified with new multispectral satellite observations offering unique skills to observe the ozone pollution plumes near the surface. 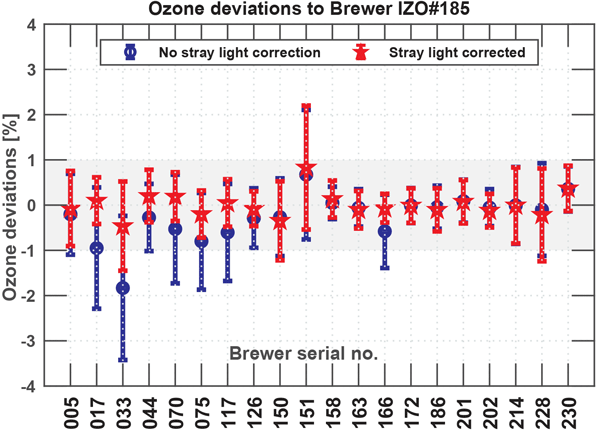 This work shows an overview of the total ozone comparison of the Brewer instrument during the 10th RBCC-E campaign in a joint effort with the EUBREWNET COST 1207 action. The status of the network after 2 years of calibration shows 16 out of the 21 participating Brewer instruments (76 %) agreed within better than ±1 %, and 10 instruments (50 %) agreed within better than ±0.5 %. After applying the final calibration and the stray light correction all working instruments agreed at the ±0.5 % level. This work, performed at the Royal Belgian Institute for Space Aeronomy and the second in a series of four Ozone_cci papers, reports for the first time on data content studies, information content studies, and comparisons with co-located ground-based reference observations for all 13 nadir ozone profile data products that are part of the Climate Research Data Package (CRDP) on atmospheric ozone of the European Space Agency's Climate Change Initiative. We present the wavelength calibration of the travelling reference Brewer spectrometer of the Regional Brewer Calibration Center for Europe at PTB in Braunschweig. We compare these results to those of the standard procedure for the wavelength calibration of the Brewer. The results of the laser-based calibrations reproduce those obtained by the standard operational methodology and show that there is a underestimation of 0.8 %, due the use of the parametrized slit functions. The electrochemical concentration cell ozonesonde is a balloon-borne instrument that measures ozone to an altitude of ~30 km. This work summarizes the National Oceanic and Atmospheric Administration's 50+ year, eight-site ozonesonde network history, the processing techniques utilized to account for instrumental changes, and the uncertainty of the measurement. The ozonesonde measurements were compared to satellite measurements and agreed well. This important data set is more useful and robust. We investigate a discrepancy between model simulations and observations of HCl in the dark polar stratosphere. In early winter, the less-well-studied period of the onset of chlorine activation, observations show a much faster depletion of HCl than simulations of three models. This points to some unknown process that is currently not represented in the models. Various hypotheses for potential causes are investigated that partly reduce the discrepancy. The impact on polar ozone depletion is low. The Brewer spectrophotometer has been used for decades as reference instrument to retrieve total ozone column (TOC) and for validation of satellite based measurements. This spectrophotometer has a thermal sensitivity already known, which is usually characterized using two different retrieval procedures. 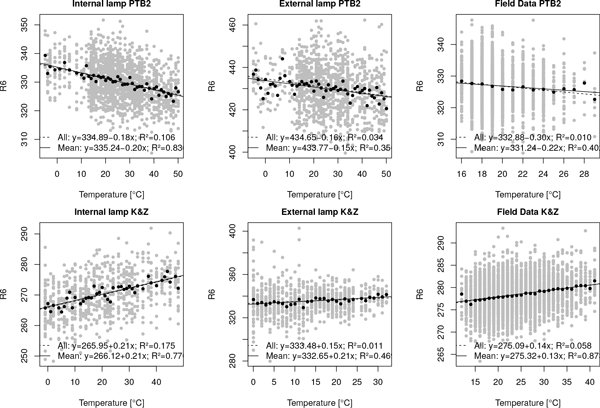 In this work, we report on a comparative study of the temperature coefficients retrieval procedures, obtaining differences less that 0.08 % in TOC when using any of the procedures. The paper presents results of a Brewer MKIV optical depth measurements from 1994 to 2016. The optical depth values were determined for the wavelengths of 306.3, 310, 313.5, 316.8 and 320 nm. The Langley plot method was applied to calculate the aerosols optical depth. A statistically significant decrease in the total optical depth of the atmosphere was observed with all examined wavelengths. Its root cause is the statistically significant decline in the optical depth of aerosols. The article mentions several symptoms of recovery. Multilinear regression analysis provides significant increase since 2001 of total ozone in Sept and during the period of maximum ozone destruction (15 Sept–15 Oct). There is significant decrease of ozone mass deficit for the same periods, decrease of relative area of total ozone values lower than 175 DU within the vortex (1 Sept–15 Oct since 2010) and a delay in the occurrence of ozone levels below 125 DU since 2005 for the 1 Sept–15 Oct period. 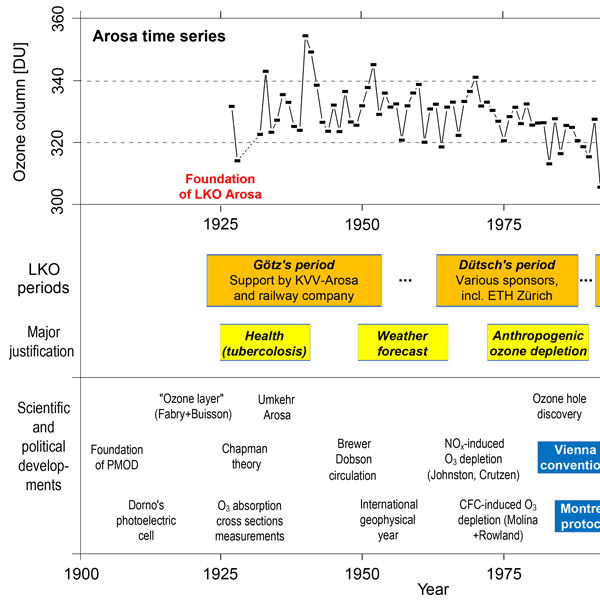 In 1926, total ozone series started in Arosa (Switzerland). Since the mid-1970s ozone is measured to document the effects of anthropogenic ozone-depleting substances (ODSs). ODSs peaked around the mid-1990s, resulting from the Montreal Protocol (1987) and its enforcement. Chemical ozone depletion stopped worsening around the mid-1990s but the large variability complicates demonstrations of the success of the protocol and the effect of ongoing climate change still requires continuous measurement. We point out the representativeness of single lidar stations for zonally averaged ozone profile variations in the middle/upper stratosphere. 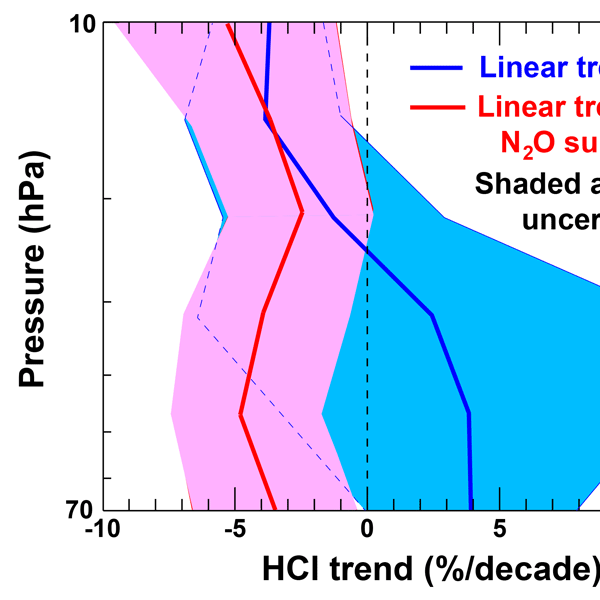 We examine the contribution of chemistry and natural proxies to ozone profile trends. Above 10 hPa an “inflection point” between 1997–99 marks the end of significant negative ozone trends, followed by a recent period of positive ozone change in 1998–2015. Below 15 hPa the pre-1998 negative ozone trends tend to become insignificant as we move to 2015. The Ozone Mapping and Profiler Suite Limb Profiler measures scattered sunlight, which is then inverted to obtain vertical profiles of ozone in the atmosphere. We have developed a new algorithm for inverting the data which is better suited for areas with large horizontal ozone gradients, such as the polar vortex. Data from the full currently 5-year mission have been processed and are publicly available. Detecting trends in short data sets of stratospheric molecules is difficult because of variability due to dynamical fluctuations. We suggest that one way around this difficulty is using the measurements of one molecule to remove dynamical variability from the measurements of another molecule. We illustrate this using Aura MLS measurements of N2O to help us sort out issues in the determination of trends in HCl. This shows that HCl is decreasing throughout the middle stratosphere as expected. 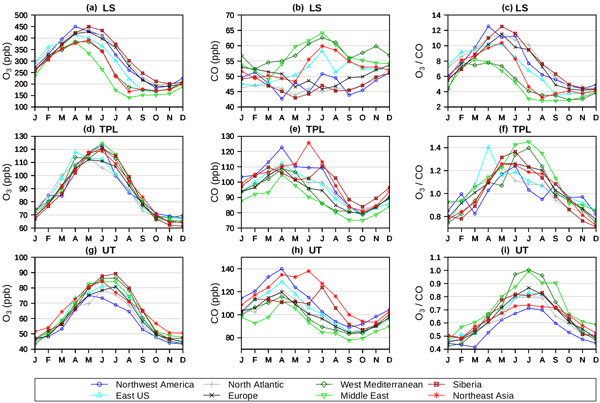 Measurements of ozone and carbon monoxide were performed during 1994–2013 around the tropopause on board commercial aircraft. Seasonal cycles and trends were calculated above eight well-sampled regions in Northern Hemisphere midlatitudes. CO shows decreasing concentrations over the last 10 years, thus reflecting the impact of the legislation on anthropogenic emissions. Ozone amounts increased over the 20 years in the upper troposphere during different seasons, depending on the longitudes. 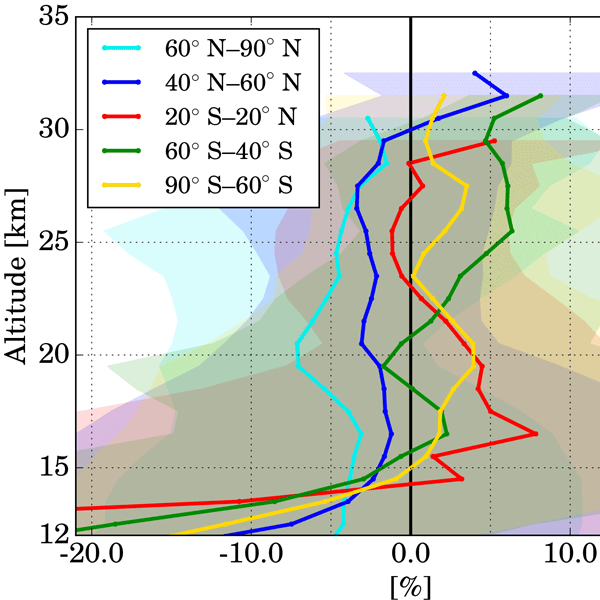 This paper describes the development of a retrieval algorithm at the University of Bremen which derives stratospheric ozone profiles from limb observations performed by the OMPS satellite instrument. Here we present the implementation of the algorithm and the validation of our results (1 year of data against independent satellite and ground-based measurements). Good agreement is generally found between 20 and 55 km, mostly within 10 % at all latitudes. 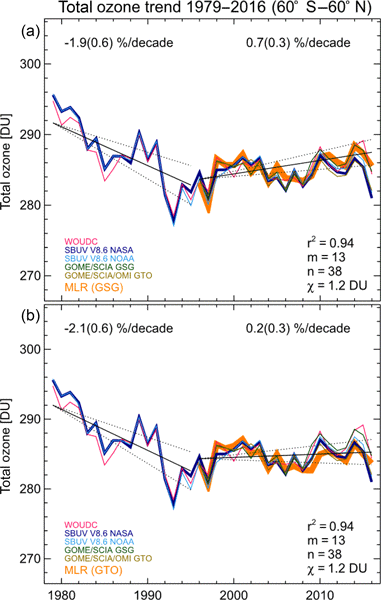 In this work we compare three key constituents of the middle atmosphere (ozone, NO2, and NO3) from the GOMOS satellite instrument with the WACCM model. We find that in the stratosphere (below 50 km) ozone differences are very small, but in the mesosphere large deviations are found. GOMOS and WACCM NO2 agree reasonably well except in the polar areas. These differences can be connected to the solar particle storms. For NO3, WACCM results agree with GOMOS with a very high correlation. 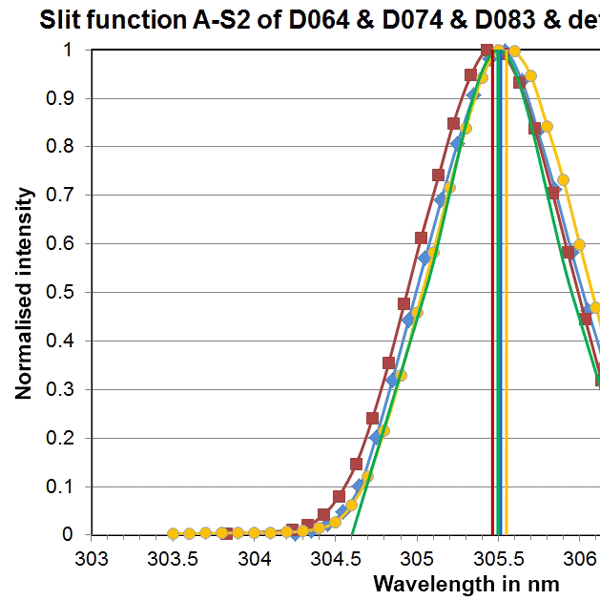 Laboratory investigations of optical characteristics of three standard Dobsons provide real wavelength settings and slit functions. These parameters were compared with the original values given in the manuals. The differences between real and nominal values are not too large, but their application will in any case improve the quality of the total ozone column measurements in the global network. This improvement was the main objective of the ATMOZ project funding these activities. 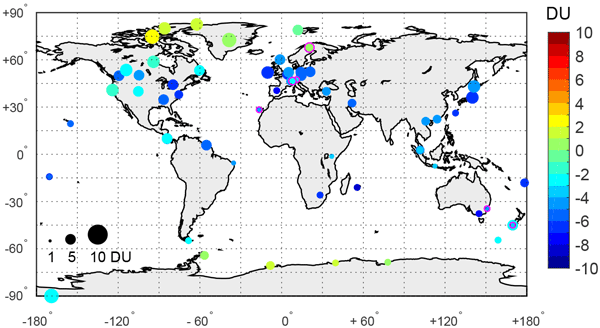 We present 1 year of ozone measurements form two ground-based microwave radiometers located at Ny-Ålesund, Svalbard. The ozone measurements cover an altitude range of 25–70 km altitude and have a high time resolution of 1–2 h. With these datasets and model data a comprehensive analysis of the ozone diurnal cycle in the Arctic is performed for the different insolation conditions throughout the year. In the stratosphere we find a diurnal cycle which persists over the whole polar day. The European Brewer Network (EUBREWNET, COST Action ES1207) is comprised of close to 50 instruments and currently provides near-real-time ozone and UV data. Aerosols also play key role in the Earth–atmosphere system and introduce a large uncertainty into our understanding of climate change. In this work we describe and validate a method to incorporate the measurement of aerosols in EUBREWNET. We find that this Brewer network can provide reliable aerosol data across Europe in the UV range. The GOME-type Total Ozone Essential Climate Variable (GTO-ECV) is a level-3 data record, which combines individual sensor products into one single cohesive record covering the 22-year period from 1995 to 2017, generated in the frame of the European Space Agency's Climate Change Initiative Phase II. The exceptional quality of the level-3 GTO-ECV v3 TOC record temporal stability satisfies well the requirements for the total ozone measurement decadal stability of between 1 and 3 %. This paper commemorates the 30-year anniversary of the initial signing of the Montreal Protocol (MP) on substances that deplete the ozone layer. The MP is so far successful in reducing ozone-depleting substances, and total ozone decline was successfully stopped by the late 1990s. Total ozone levels have been mostly stable since then. In some regions, barely significant upward trends are observed that suggest an emergence into the expected ozone recovery phase. In order to broaden the knowledge of long-term UV radiation variability, we have reconstructed and analyzed a 50-year-long UV radiation time series from Hradec Králové, Czech Republic. The UV radiation intensities increased greatly following the decline of ozone amounts in the 1980s and 1990s. High UV radiation doses were observed in days with low ozone amounts, clear or partly cloudy skies, or snow cover. 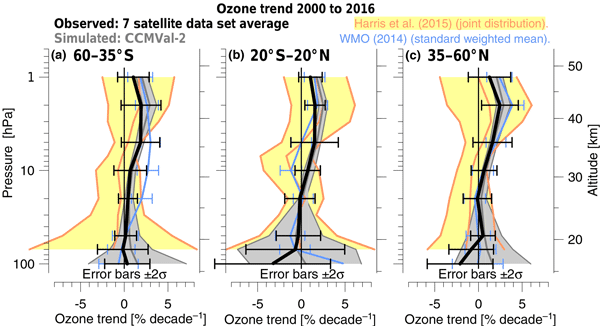 OSIRIS satellite measurements of ozone in the stratosphere are corrected for slowly varying errors. 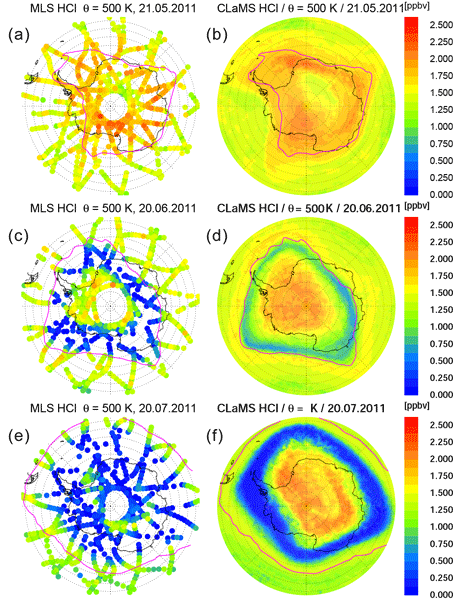 These changes make the OSIRIS data compare better with other satellite measurements over the long term and make an impact on our understanding of the recovery of the ozone layer. An ozone trend analysis that compensates for sampling biases is applied to sparsely sampled occultation data sets. International assessments have noted deficiencies in past trend analyses and this work addresses those sources of uncertainty. The nonuniform sampling patterns in data sets and drifts between data sets can affect derived recovery trends by up to 2 % decade−1. The limitations inherent to all techniques are also described and a potential path forward towards resolution is presented. This work focuses on solar radiation in the tropics, more specifically on ultraviolet radiation. From ground-based and satellite observations of the chemical state of the atmosphere, we were able to model the ultraviolet measurements measured in the southern tropics with a very small error. This is a first step to modelling and predicting future ultraviolet levels in the tropics from chemistry-climate projections. 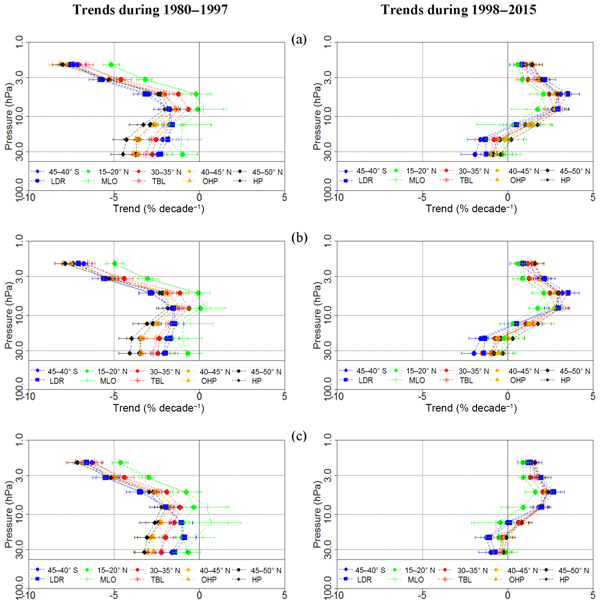 Maintaining homogeneity of long-term UV time series taken from various instruments and thus trend estimation are challenging tasks, especially for remote Arctic sites. Highlights: method of the UV data homogenization is proposed to be used at any remote site. Past UV data built from satellite total O3 and ground-based sunshine duration. Yearly UV doses trendless in the southern Svalbard for 34-year period since 1983. Long-term cloud effects on UV more important than the ozone effects there. We present comparison of ozone profiles from DIAL, MLS, and chemical transport model simulations over Río Gallegos (52° S), Argentina, during the 2009 spring. Measurements were performed in the vicinity of the polar vortex and inside it on some occasions. The results show a good agreement between DIAL and MLS with mean differences of ±0.1 ppmv between 6 hPa and 56 hPa. MIROC-CTM also agrees with DIAL, with mean differences of ±0.3 ppmv between 10 hPa and 56 hPa. We have combined measurements from a series of SBUV instruments to create the longest continuous satellite-based profile ozone record from a single instrument type (1979–2016). We assess the consistency of the profile ozone measurements across instruments to assign an uncertainty to the merged record. 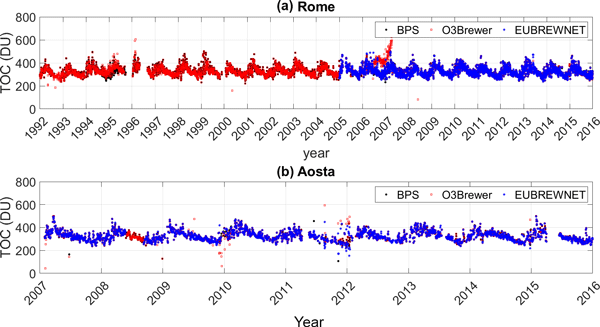 Time-series analysis shows that upper-stratospheric ozone since 2001 is increasing, but the results are not yet statistically significant when the merged record uncertainties are included. 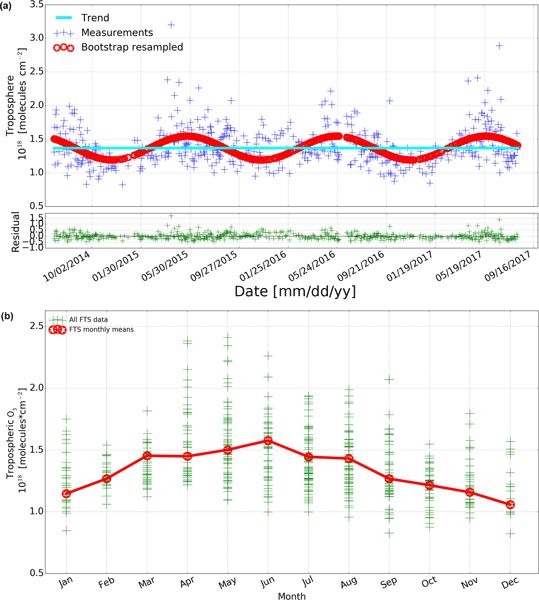 We report the first stratospheric measurements of the diurnal variation in the inorganic bromine (Bry) reservoir species BrONO2 around sunrise and sunset. The main goal of these observations was to check the current understanding of stratospheric bromine chemistry and to estimate the amount of lower-stratospheric Bry. The calculated temporal variation in BrONO2 largely reproduces the balloon-borne observations. The amount of Bry was estimated to be about 21–25 pptv in the lower stratosphere. Results of the temperature characterization of the global UV spectral measurements of eight different Brewer spectrophotometers operating in Greece, Finland, Germany and Spain are presented. Different temperature characterization methods are evaluated and an improved methodology for the correction of the measurements for the effects of temperature is presented. In this study we explore the chemical and transport processes controlling ozone abundances in different altitude regions in the tropics for the present day and how these processes may change in the future in order to determine when total-column ozone values in the tropics will recover to pre-1980s values following the implementation of the Montreal Protocol and its subsequent amendments, which imposed bans on the use and emissions of CFCs. We present a merged dataset of ozone profiles from several satellite instruments: SAGE II, GOMOS, SCIAMACHY, MIPAS, OSIRIS, ACE-FTS and OMPS. For merging, we used the latest versions of the original ozone datasets. 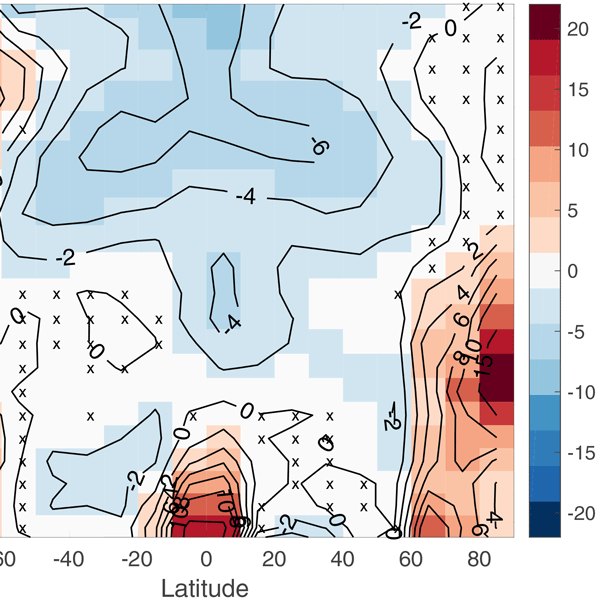 The merged SAGE–CCI–OMPS dataset is used for evaluating ozone trends in the stratosphere through multiple linear regression. Negative ozone trends in the upper stratosphere are observed before 1997 and positive trends are found after 1997. A co-located Pandora Spectrometer Instrument (Pan #034) has been compared to a well-calibrated Dobson spectroradiometer (Dobson #061) in Boulder, Colorado, and with two satellite instruments over a 3-year period. The results show good agreement between Pa n#034 and Dobson #061 and with the satellite data within their statistical uncertainties. Thanks to the 1987 Montreal Protocol and its amendments, ozone-depleting chlorine (and bromine) in the stratosphere has declined slowly since the late 1990s. Improved and extended long-term ozone profile observations from satellites and ground-based stations confirm that ozone is responding as expected and has increased by about 2 % per decade since 2000 in the upper stratosphere, around 40 km altitude. At lower altitudes, however, ozone has not changed significantly since 2000. We introduce a 10-year record (2003–2012) of AIRS/Aqua observations of gravity waves in the polar lower stratosphere. The data set was optimized to study the impact of gravity waves on the formation of polar stratospheric clouds (PSCs). 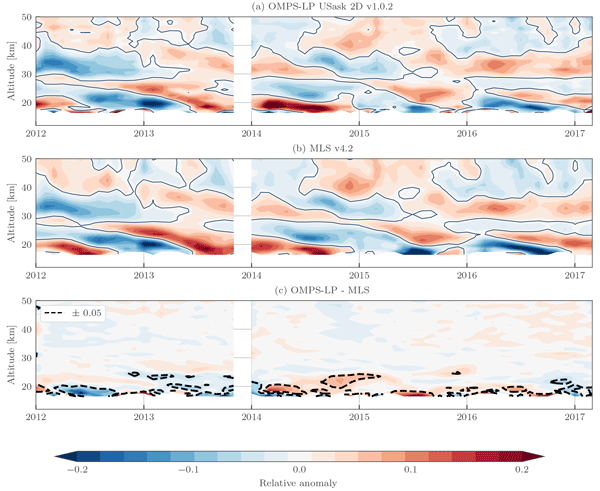 We discuss the temporal and spatial patterns of gravity wave activity, validate explicitly resolved small-scale temperature fluctuations in the ECMWF data, and present a survey of gravity-wave-induced PSC formation events using joint AIRS and MIPAS observations.